"Today solidarity with migrants is a crime. Save people from drowning in cold waters and you are a human trafficker. Open a shelter for stranded people in an abandoned train station and you are a trespasser. Give food to the hungry and you are a threat to hygiene standards. Criticize rough detentions by the police and your behaviour is insulting. Open free showers and you are infringing urban law. Protest against a forced deportation on a plane and you are obstructing a flight. Watch an illegal expulsion from a squat and you are detained. Oppose repressive laws and you are a terrorist. Not only are International Non Governmental Organisations that rescue migrants at sea accused of collusion with traffickers and facilitating illegal migration, but their right and obligation to help and save lives is being denied in some Member States. The leap from denial of solidarity to criminalization has led to an increase of deaths of migrants at sea. 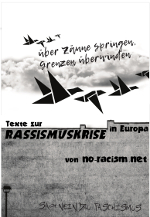 Today caring for refugees and migrants, demanding respect for fundamental human rights, fighting racism and xenophobia – the very principles upon which the European Union was founded - have been consigned to the dustbin by Fortress Europe and by restrictive policies and legislation in various Member States. Further, since the start of 2018, the proliferation of cases and fronts (with the Alps becoming tainted as a place where migrants die trying to cross borders) and the intensity of onslaughts by the police, judiciary, political powers and far-right militants, and increasingly media and public opinion, mean that hostility to solidarity is now mainstream. It is crucial to understand the inevitability of this authoritarian drift, driven in part by specific populist or anti-immigrant politicians and authorities in member states." "The criminalization, stigmatization and delegitimation of human rights defenders have also been prominent in attempts to impose harsh conditions for immigrants all over Europe, to preempt criticism, which also restricts freedom of expression through intimidation. There is also a prominent and increasing overlap of the policy ambitions of EU authorities with far-right, fascist and populist groups who intimidate and attack activists, civil society organisations and migrants. The EU Agenda on Migration’s pursuit of maximalist goals is proving destructive for both civil society and principles such as non-discrimination and the validity of basic human rights, in view of the instrumental forms of reasoning which are at work. The interplay between these different forms of encroachment will be key to understanding Europe’s future. The EU is now at a crossroads. Its attempt to create a European citizenship and identity in opposition to third-country nationals is being doggedly resisted by a sizable part of its population and Member States’ governments. In parallel, however, a strong bond is being formed between like-minded people across Europe who refuse to accept the degradation of Europe in pursuit of questionable policy aims. In effect, European civil society are challenging the policies enacted by Member States, national authorities and EU institutions that are regressive and authoritarian. Through civil disobedience and support for migrants’ rights they represent the real “constituent” force of a new European de-colonized project based on justice and rights for all. Since solidarity has been framed as a crime and a whole apparatus is being put in place to prosecute and drain the forces of any dissidence, activists and citizens should look for past and present examples to open up new spaces, promote respect for life, dignity and freedom of movement. This is not just because of migrants’ rights, but also because criminalization promoted by high-level authorities is putting the core values of European democracies at risk. Today, the front line is migration. Tomorrow, these techniques could be used widely in Europe against anyone campaigning on the environment, free speech, diversity and so on. In fact, any kind of freedom or rights is at risk when criminalization is used as a strategy."